This video is the seventh in a series retracing the life of Mary Rabagliati, who helped Joseph Wresinski co-found ATD Fourth World. After Mary had spent eleven years supporting families in extreme poverty in England, France, and the United States, she enrolled at the London School of Economics to prepare herself for taking on greater responsibility for ATD Fourth World. One of her fellow students was a South African woman who invited Mary to go on a six-week study trip to South Africa. 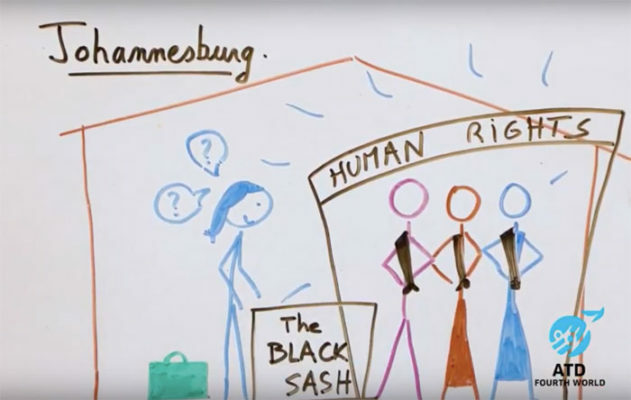 Since 1948, South Africa had been governed under a system of racial segregation and discrimination known as apartheid — a word meaning ‘separateness’ — for the benefit of the white population. 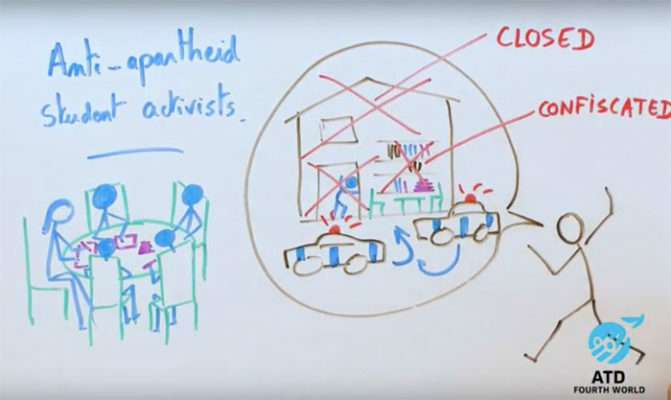 Throughout the 1970s, the apartheid government in South Africa carried out the mass removal of 3.5 million non-white South Africans from their homes to ten designated Bantustans, referred to by the government as ‘homelands’. Mary’s visit to South Africa took place in the midst of this period of upheaval in May and June of 1973. Her goals were to discover and learn from the ways people were trying to resist this extreme form of exclusion. Mary was appalled. Following that visit, she brought up the subject with most of the black South Africans that she met. They told her that black people hate the dormitories and consider them to be a violation of family life. They also pointed out that the area surrounding these dormitories was plagued with violence, including sexual assault. Looking back on her visit, Mary observed that “black South Africans clearly have an immense potential; but this potential is mostly hidden because the adults must work such long hours that they have very little energy left for anything else.” Determined to gain a wider perspective, she decided to visit some of the newly independent nations of Africa to learn how people in those countries were struggling against poverty and exclusion. This and the content of other videos in the series will be published in 2019 under the title Quiet Revolution: The Story of Mary Rabagliati and People the World Forgot.